Previous Article Heartwarming moment stranded dog is rescued 209km out to sea — but how did she get there? As the Notre Dame Cathedral went up in flames early on Monday evening, devastated Parisians gathered on the banks of the Seine and wept, while dazed tourists looked on aghast. France’s President Emmanuel Macron warned the fire could continue burning for days, saying “the battle is not yet totally won”. 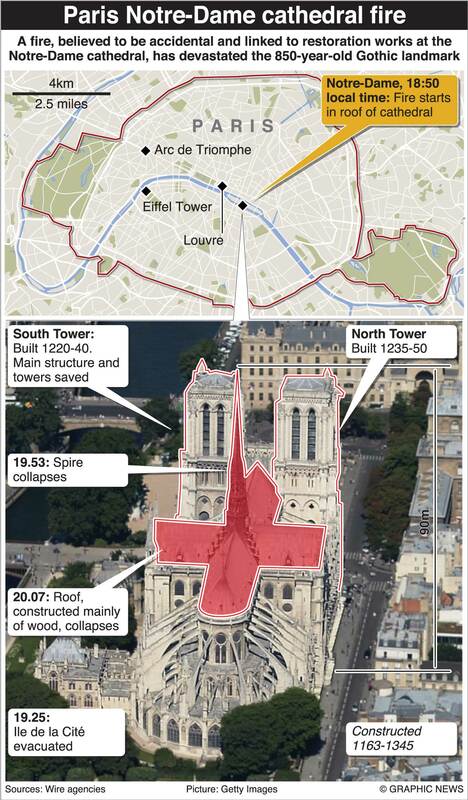 The exact cause of the blaze was not known, but the Paris fire brigade said the fire is “potentially linked” to a six million euro ($9.48 million) renovation project on the church’s spire, and its 250 tons of lead. The Paris prosecutors’ office earlier ruled out arson and possible terror-related motives, and said it was treating the fire as an accident. Bertrand de Feydeau, vice president of preservation group Fondation du Patrimoine, told France Info radio the wooden roof was built with beams more than 800 years ago from primal forests. Fire hoses looked overmatched — more like gardening equipment than firefighting apparatus — as flames raged across the cathedral’s wooden roof and burned bright orange for hours. The fire toppled a 91-metre spire and launched baseball-sized embers into the air.